Hannover 96 produced an impressive second-half comeback to beat Hamburger SV at the Volksparkstadion in Matchday 11's curtain-closer. With Pierre-Michel Lasogga and Sven Schipplock starting up front together for the first time this season, it was unsurprising to see Hamburg begin in an attacking mood. Indeed, only six minutes had gone when the hosts took a deserved lead, Nicolai Müller bypassing the strike duo to tee up Michael Gregoritsch to poke home from close-range for a maiden strike at the Volksparkstadion. Bruno Labbadia’s side continued to impress, pinging the ball about crisply, and came within inches of a second when Marcelo Diaz’s curling free-kick struck the post in the 29th minute. Hannover came out of their shell somewhat in response before the break, although only Artur Sobiech’s header tested HSV keeper Rene Adler. The visitors emerged a different side after the restart, however. Michael Frontzeck's charges pressed forward fearlessly and levelled in the 59th minute when Hiroshi Kiyotake powered his spot-kick past Adler. The Japanese was the architect of his side’s second goal eight minutes later, dinking in a superb cross for Salif Sane to head home powerfully. Stunned, HSV struggled to muster a response, and despite substitute Ivo Ilicevic's best efforts, Hannover held on to record a priceless three points in the fight against the drop. 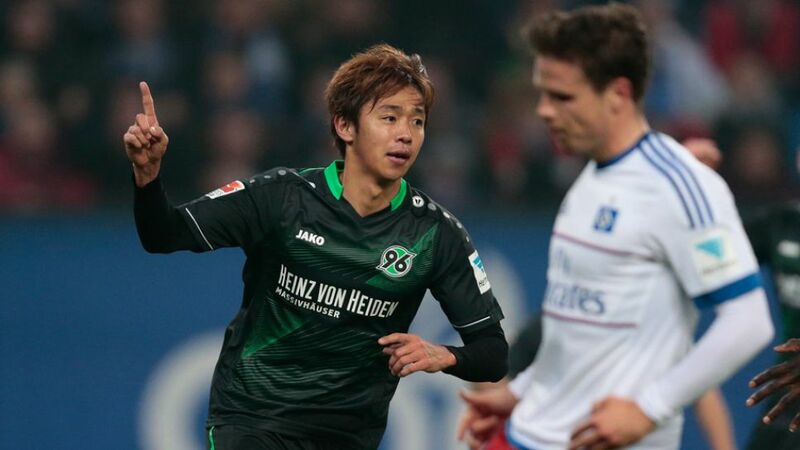 Kiyotake was key to Hannover’s second-half turnaround. The Japanese international was influential in everything positive his side did going forward, calmly firing his penalty past Adler and then brilliantly teeing up Sane’s winner. After waiting eight games for a first victory of the season, Hannover have now prevailed in three of the last four encounters. The same never-say-die attitude which inspired those victories was on show in Hamburg to ensure three points which lift Frontzeck’s troops back out of the relegation zone. Both of Sane’s goals this season have won the game for the 96ers.Kiyotake has had a hand in six of Hannover’s last seven goals.Müller’s assist was his first of the campaign.Gregoritsch scored on home turf for the first time in a HSV shirt.